When you’ve got to charge a whole stack of devices at once, all those cords can get messy—and that’s if you have enough wall adapters to do it. Today, Amazon’s got a great deal on a handy charger that makes powering multiple devices a breeze. 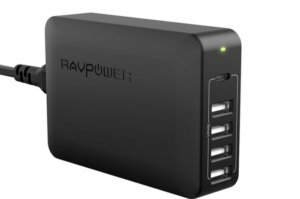 You can get a 60 watt RavPower charger with five ports, including one USB-C, for $20 with the code RAVPKK59. That’s $10 off the charger’s list price of $30.